The Travels of John Prideaux 1900. Cornwall to London. The Travels of John Prideaux 1900. Cornwall Summer. The Travels of John Prideaux 1900. New York to Liverpool aboard S S Lucania. The Travels of John Prideaux in 1900. Portland to New York. A L Rowse. A Clever Boy. Fowey Tide Tables and Kelly’s ice cream. How to calculate the effects of sea level rise and fall. John Prideaux was aware from birth, that he was rich and a member of the great families of Cornwall and Devon. The two counties mixed through marriage, inheritance and business and the Prideauxs have joined with each and everyone of them at sometime or other. John expected to make a good marriage with the responsibilities to Crown and country and family. He must produce an heir and a spare and maintain and increase the Prideaux fortunes. He must be keep aware of the current politics and ensure that he followed the correct leader as that could change at a moments notice. John Prideaux’s lifetime was no different to many before and after him. Fortunes could change on the whim of a new King and soon, religion would make a difference. During these times ,there were many fights between the Yorkists and the Lancastrians. There was a lot of support for the Lancastrians in the West Country and many aligned with their Welsh cousins.The marriages of William Prideaux to Alice Gifford of Theuborough and Fulke to Sir Richard Edgecombes daughter showed where their sympathies and politics lay. Sir Richard was knighted by Henry Tudor for his support in the overthrow of Richard III in 1485. The War of the Roses was over. There is a very strong possibility that Fulke was fighting at the Battle of Bosworth. Most common people of the time could not care less about the conflicts between Lancastrian and Yorkist nobles. However a number of families in Devon and Cornwall had joined the Duke of Buckingham’s unsuccessful conspiracy to overthrow Richard and among those who fled to Brittany to join Henry Tudor were Sir Thomas Arundel, John Trevelyan, John and William Treffry and Richard Edgecombe. It is said that Edgecombe escaped capture by throwing his hat, weighted with a stone into the Tamar. His pursuers thought he had drowned and he was able to make good his escape. His family lands in the South Hams including Orcharton and Adeston were willed to him. These were the longest owned and most beautiful and fertile lands, with warm weather and easy access to the sea. 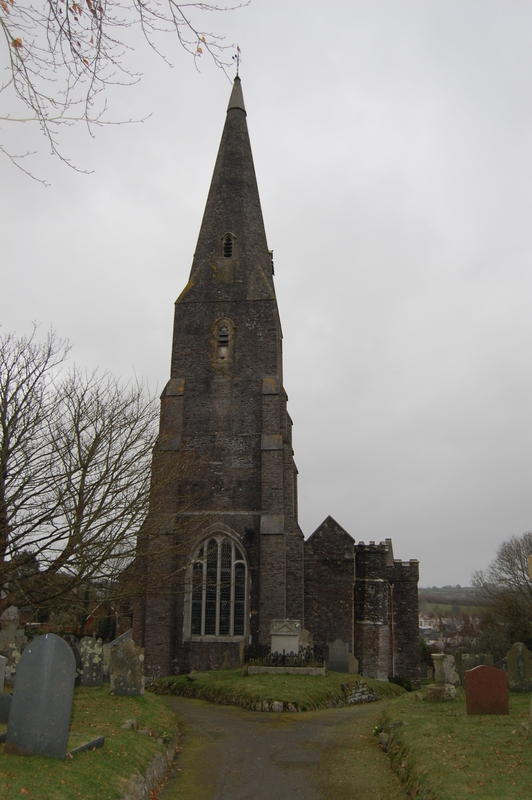 His brother Fulke Prideaux, inherited Theuborough near Sutcombe on the North Devon coast. These substantial manors arrived in the Prideaux household with their mother Alice Gifford. John Prideaux and his heirs were to inherit these lands, should Fulke die childless. Fulke firstly married Jane Edgecombe, the daughter and heir of Sir Richard Edgecombe. She died without issue. Incidentally, you may often see the letters dsp after someones name in a family tree. This abbreviates the Latin phrase, descessit sine prole, which translates to died without issue. John Prideaux may have thought that he was in with a chance of inheriting the North Devonian lands to add to his first marriage. John Prideaux was named as heir in his brothers inheritance at Adeston and also at Theuborough, should Fulke Prideaux and his wife die childless. But Fulke soon married Katherine the daughter of Sir Humphrey Poyntz and as if to drive it home with a mallet, they produced thirteen children, although not all survived for many years. It was a wife’s duty for many centuries, indeed probably until relatively recently, to produce children as regularly and as often as they were able. Their first born son was Humphrey , who became the heir. The name Humphrey Prideaux was given many times in this Prideaux line. A sister Jane married William Wyke. John Prideaux married Sybell of Luson in Ermington which lay less than a mile from Adeston. Sybell, although a neighbour at Adeston would not see John regularly as the Prideaux family had made their home at Theuborough when William married Alice. But I hope that theirs was a love match. The couple eventually died within a few weeks of each other in 1523. The plague and sweating sickness had been doing the rounds again and it may be reasonable that they had caught one of those illnesses. When they died in 1523 they were survived by four sons, Hugh, John, Henry and Thomas. Hugh the heir, perhaps named after his maternal grandfather, died on 6th December 1559, when his son John was only seven. This John stayed in the parish of Harford at Stowford, an area which features strongly in this story for the next few generations. He died aged 73 in 1625, is buried at Ermington and is named in his grandsons’ marriage settlement. 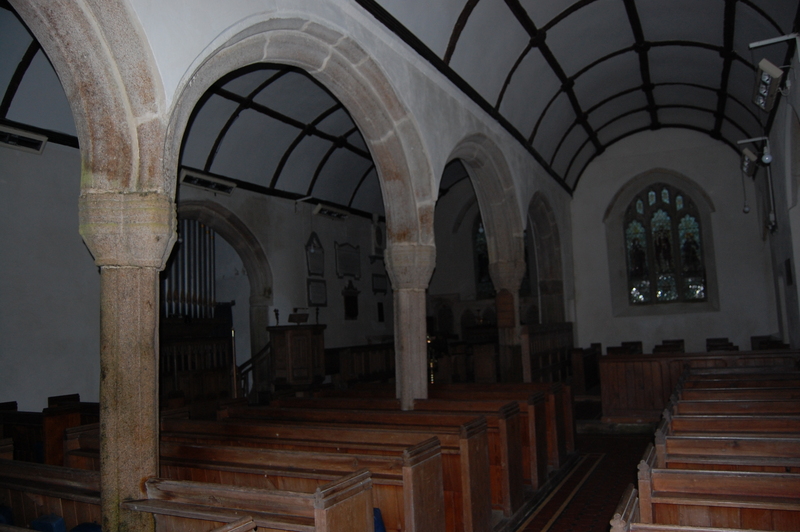 His son Thomas was churchwarden at Ermington in 1627 and baptised his own son Arthur in 1628. These cousins were useful to my line during the civil war period and helped each other out. 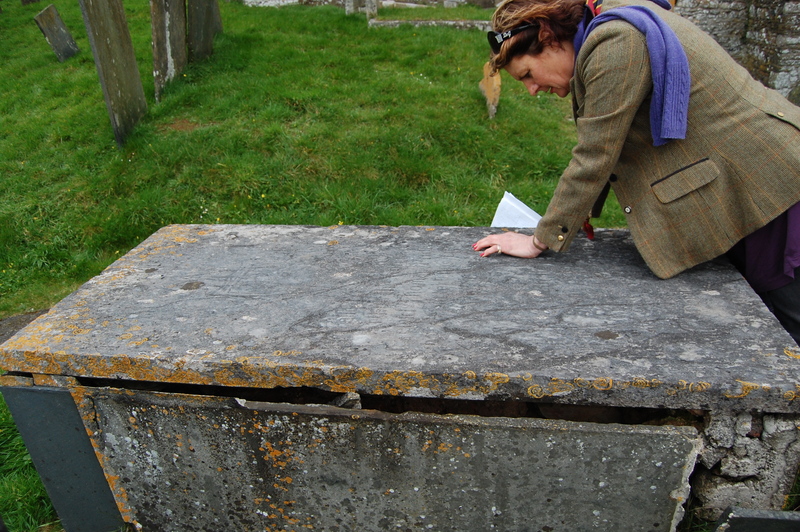 To the left is the author looking at his gravestone. During the 15th century, parish churches were rebuilt along with manor houses. Stone bridges were built across large rivers and stonemasons and woodcarvers were employed everywhere. The building industry was as important in Devon and Cornwall as tin mining and the production of cloth. The birth rate began to rise along with the prosperity. Now we can see how the lines of the family keep branching out and shrinking throughout the centuries. This was a trend common through all families, and the Prideauxs were lucky in that they had some branches continuing keeping the blood connection going. So far the family had been mainly on the up, income and land holding going from good to really good. Younger sons and daughters were encouraged to make good marriages trading on the family name and connections. It had always worked. Business dealings helped more as time went on, but now we were heading into a time where it was not so easy to stay rich, even with these connections. So now some of these younger sons were considering work as stonemasons and carpenters, who were sought out everywhere. The building industry was where our line of Prideauxs found work for three hundred years from the mid 1600’s onwards. When Henry VIII became King in 1509, many changes took place in the country. Not least the excommunication from Rome. Now the dissolution of the monasteries could begin. The little Benedictine priory of Tywardreath was one of the first to go by the Act of 1536. It’s condition was terrible. Prior Collins and his six monks were all that were left. His tenant Thomas Treffry was a friend of Cromwell and he ensured that the Priory was closed and the lands sold to the gentry. The stones of the priory were carried away to build new large houses. The only stone remaining is the gravestone of Prior Collins. The monks went off to live a secular life. 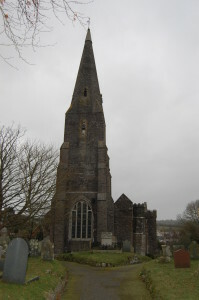 Nicholas Prideaux became Steward to Shere of Launceston and helped dissolve the monasteries there. He was rewarded with very long and cheap leases of the tithes of a number of parishes including Padstow. This was the start of the branch of Prideaux building the huge property there, known as Prideaux Place, which is so famous today. Nicholas was the great grandson of Fulke Prideaux. John Grenville secured a lease of the Tywardreath estates in the autumn of 1536. The Protector Somerset took them. The priories and monasteries were stripped down and plundered by gentry and merchants alike,ruining them forever. They increased their own holdings by adding on to their own properties. John Leland, the Kings librarian, travelled to Cornwall during this period of time and made many notes about the area which have proved invaluable to historians for years. He noted the sheep grazing at Tintagel and that it must have been a large place in its time. He thought Padstow unclean as it was so full of Irishmen. He considered St Austell famous for nothing but its church and Tywardreath famous only for the Priory which was still standing at this time. Castle Dor he could not find, but the keep was still standing at Restormel. Barges could come within half a mile of Lostwithiel during this time. The sand from the tin works being blamed for blocking up to the bridge with waste. Celia Fiennes, traveling in 1698, found St Austell full of comely women and enjoyed West Country tarts with clouted cream, but disapproved of the men, women and children smoking. She was very impressed with the mines and gave a wonderful description of how mining was done. The times were a’ changing again. 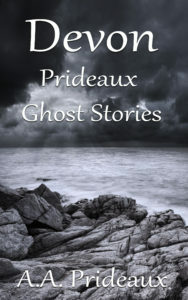 John stars in the story The Terror of the Thunderstorm in the book Devon Prideaux Ghost Stories. A tale of two piers – Blackpool Central and Llandudno. AAPrideaux.com, Proudly powered by WordPress.